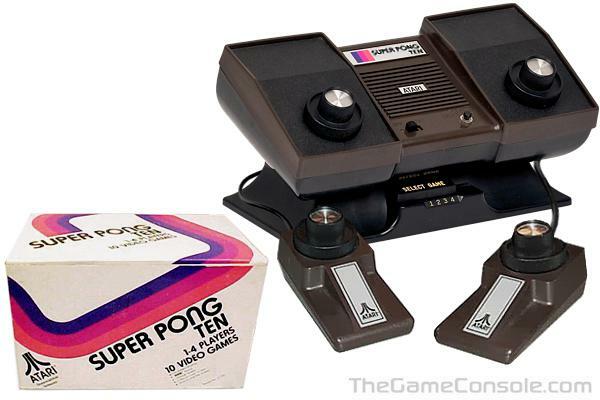 The Atari Super Pong 10 added 6 new variations of games, plus the ability for up to 4 players to participate in the games. Atari would introduce something entirely new for their home console line. The addition of hand held external Paddle controllers. Video game players were no longer bound to sit up close to the console, bumping elbows with their fellow gamers. Now two additional players could sit with some comfortable space between them and play the various Pong games. The Paddle controllers would introduce a shape and a trend that would follow into many other generations of controllers throughout Atari's designs. Their wedged shape design would influence Atari controller design for consoles such as the unreleased Atari 2700 remote control joysticks, the Atari 5200 joysticks and the Atari 7800 ProSystem joysticks. All of the controllers having the same basic wedged shaped design.